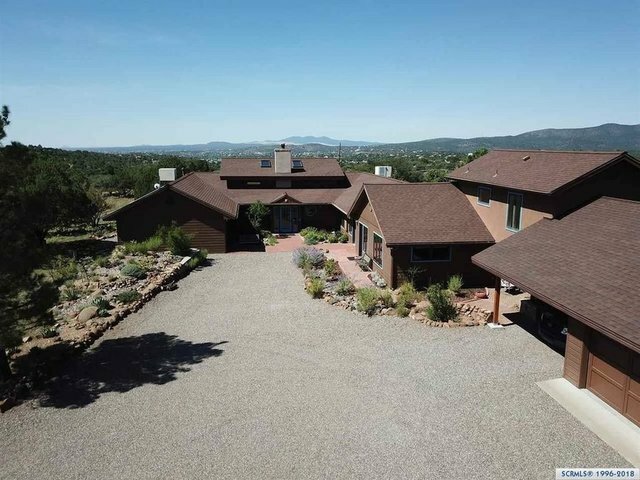 This high quality home in a prime location captures tremendous views, abundant natural light and passive solar heat while providing privacy and seclusion. The upgraded home has an awesome great room, master suite and dining room that all showcase their scenic southern exposure and each opens onto a huge Trex deck with pergola. The updated, spacious kitchen has granite counters, stainless appliances, custom cabinets and a butler's pantry. This impeccable 4-bedroom home features a master wing, guest wing, PLUS guest suite AND studio apartment each with en-suite bathrooms. Master bath features large tiled shower, jetted tub and walk-in closet. The home also includes a large foyer, office with private entry, library/study, large utility room and an oversized heated garage with workbench. Massive storage throughout the home. Enjoy the beautiful landscaping, outdoor areas, garden and over a mile of hiking trails on the 13.5 wooded acres. Much more - call for more information today!